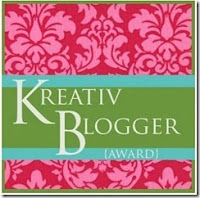 A big thank you to Dana over at Mid2Mod for nominating me for the Kreativ Blogger award! I love her blog and I have learned so much about mid-century design from her posts. If you have a chance, stop on over and check it out! 1) My "day job" is as a trumpet player and teacher. I went through school intending to be an orchestral musician and only after I graduated with a degree in Music did I realize that I wasn't good enough for that. But I still play and have fun. 2) Since that gig didn't work out as I anticipated, I went back and got a Master's in Museum Science. I was a museum curator for a while until deciding to stay at home with my kids. 3) I definitely do not like standard 9-5 office work, and really hate being told what to do. I am much happier being self-employed! 4) I take great pride in finding and using old versions of new objects. I do all my cooking and household chores with vintage items. 5) One of my first adult collections was vintage radios/phonos (I have at least 12 that I can think of off the top of my head- most work. 6) My favorite color is olive green. Congratulations Susie and I would definately take anyone of those cars or both.